This entry was posted in Digital strategy and tagged Facebook, Foursquare, Twitter. Bookmark the permalink. Thanks for your comments all. Antony G, I understand your specific reference to annoying, and I’m genuinely apologetic and sorry for doing that to you. It was all done in the interests of ‘professional’ research, but got a bit out of hand; however I felt I learned a lot about potential use, etc., and decided that I ought to make some form of amends to you (and others) by explaining what I’d been up to. As I intimated in the blog I was feeding an addiction but you’ll be pleased to note that it has been overcome now. You won’t be pestered like that again I promise. I agree with AntonyG. Twitter and Facebook are for conversations, comments, human interaction. Not really for “I’m here”. The retort to that is generally “So what?”. i.e. a waste of screen space, a break in the wider conversations with other friends. However, break the link with FB & Twtr or moderate usage to the point where you’re sending 4sqr messages for a VALID reason, then ok, I see it’s use. Particularly from a businesses point of view. I think it’s better as a standalone app rather than an FB or Twtr portal. Not neat – annoying. Of interest to foursquare friends, perhaps, but I doubt many other people are impressed with the onslaught of “I’m at…” messages through Twitter or Facebook. Not just yours, of course. 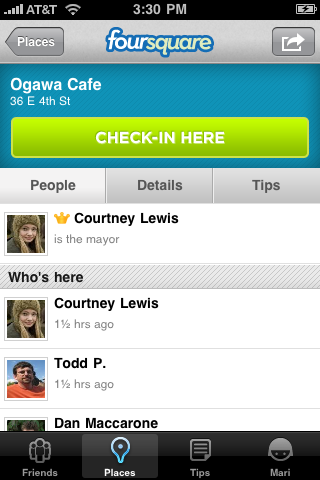 Any foursquare/Gowalla/similar apps that auto-post are the same – potential unfollow/unfriend material.